Warsaw climate talks: Developing countries will be source of greenhouse gas emissions. Can their economic self-interest help us all? The important moves are now happening in developing countries such as China. This past weekend, exhausted diplomats from around the world climbed into fossil fuel–powered airplanes and bade good riddance to Warsaw, Poland. 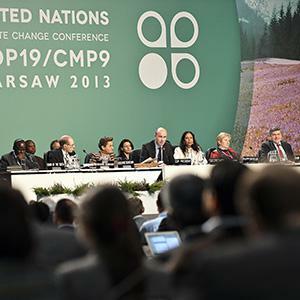 They had spent two weeks holed up in the frigid capital engaging in what has become an annual Kabuki dance over what to do about climate change. Almost exactly as has happened in prior international climate change conferences—gatherings that, like the falling leaves, have become autumnal rites—intonations about a global warming threat were offered, hope for selfless environmental cooperation was expressed, and battles over who should foot the bill were fought. By the time everyone headed for the airport, little of substance had gotten done. A session at the United Nations Framework Convention on Climate Change in Warsaw, Poland, on Nov. 22, 2013. This diplomatic sclerosis isn’t surprising, and it doesn’t mean the world is ignoring climate change. But what happened in Warsaw shows that the action has shifted in two ways that diplomats didn’t envision two decades ago, when they began negotiations toward a grand fight against global warming. First, the important moves are happening in developing countries such as China, not in developed ones such as the United States. Second, they’re happening for economic reasons that aren’t about global warming but that sometimes coincide with it. These two shifts are likely to define the world’s response to climate change for years to come. Together, they mean the world is likely to address climate change only to the extent that developing countries believe doing so will serve goals they see as more immediate and important: providing new jobs, for instance, or cleaning up sooty air. Moves that happen to curb carbon emissions as a side benefit of accomplishing other goals may not be enough to avert dangerous effects from climate change. But the traditional alternative—shouting from the rooftops that the rich world should act in the name of melting glaciers—may amount to little more than hot air. This wasn’t what diplomats expected in 1997, when they inked what many hailed as a landmark agreement to combat climate change. The Kyoto Protocol, named for the Japanese city in which it was drafted, obligated industrialized countries that ratified it to cut their greenhouse gas emissions a collective 5 percent by 2012. It didn’t require developing countries to trim their emissions. The rationale was that rich countries, which for decades had been responsible for the bulk of carbon emissions, should take the first step. The United States didn’t ratify the Kyoto accord, arguing in large part that taking on an emissions-reduction burden would hurt its ability to compete in global markets against China, which under Kyoto didn’t have to cut its carbon output. 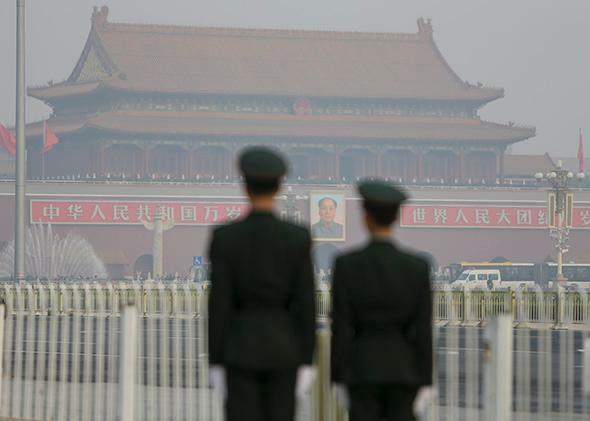 Paramilitary police officers stand guard near Tiananmen Gate in Beijing. Today, the Kyoto Protocol seems a quaint relic of a bygone era. The industrialized countries at the center of the Kyoto agreement—the United States, nations in the European Union, and Japan—are fading in importance as global carbon emitters. The developing countries that escaped any obligation to reduce emissions under Kyoto—notably China, but also India, Brazil, and much of Latin America and Africa—are the source of essentially all the projected growth in global greenhouse gas output. Over the next two decades, greenhouse gas emissions are expected to decline in the industrialized world and nearly double in the developing world, according to the International Energy Agency’s latest World Energy Outlook, an annual status report on worldwide energy that was issued this month. Despite the lofty rhetoric in Kyoto, Warsaw, and other cities that have hosted climate talks, the slowdown in rich-world emissions isn’t largely the result of any intentional effort to combat climate change. It’s due, rather, to other economic trends. The United States, Europe, and Japan have mature economies; thanks simply to time, their industrial growth, and thus their greatest increases in energy consumption and emissions, are behind them. What’s more, the steady reduction in the carbon intensity of their economies—the amount of carbon these countries cough out per unit of gross domestic product—is the result of technological development intended to save money, not to save the planet. One of the biggest contributors to slowing emissions in the United States, for example, is the meteoric rise of shale gas as an electricity source. For every bit of electricity it produces, natural gas emits about half as much carbon dioxide as does coal, the fuel that U.S. shale gas is largely supplanting. Yet the rise of shale gas isn’t due to some anti–global warming Manhattan Project. It’s the culmination of two forces: innovative and dogged oil companies out to make a fortune, and federal research spending designed to boost domestic fossil fuel supplies and reduce imports from the Middle East. Japan’s announcement elicited righteous indignation from China. China, which as a developing country was exempted from the Kyoto climate accord’s requirements, recently overtook the United States as the world’s top carbon emitter. As result, it has come under increasing international pressure to take on a carbon-reduction pledge. But Chinese climate negotiators at the Warsaw conference made clear their government has no intention of doing so, particularly when industrialized countries such as Japan are backpedaling. China’s own emissions are soaring—not just because China has a population of 1.4 billion people but also because China manufactures for the world. 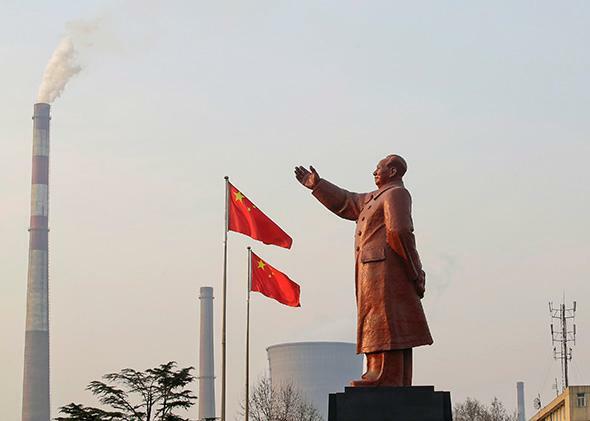 And yet there are signs that China—yes, China!—may end up curbing its emissions more than any other country. It has pledged to ramp up the proportion of electricity it generates from nuclear and renewable energy. It has imposed relatively stringent fuel-efficiency requirements for cars. It’s rolling out a bevy of policies designed to curb pollution from coal-fired power plants. 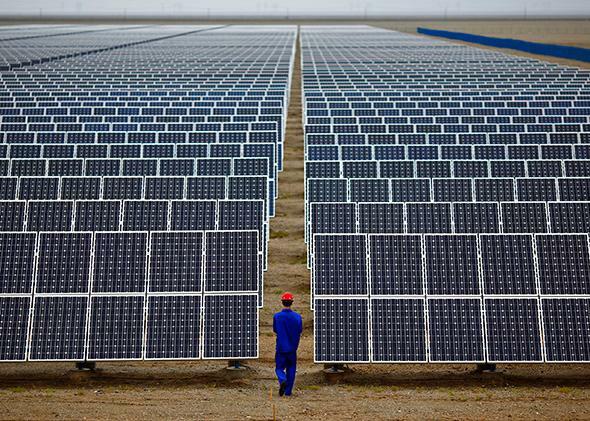 A worker inspects solar panels at in Dunhuang, China. Why? Not primarily to curb carbon dioxide emissions. China is beginning to move toward a cleaner energy mix for reasons far more palpable than a colorless, odorless gas. The air in China’s major cities is often so dirty that it stings the eyes and sickens the lungs; that’s a public-health problem that could become a political threat to Beijing’s rulers. In addition, the push toward cleaner energy sources is creating new jobs and new export industries for China—another tangible political benefit. China isn’t the only developing country that may end up curbing its greenhouse gas emissions for reasons other than climate concern. Brazil in recent years has markedly slowed deforestation in the Amazon—a major contributor to overall greenhouse gas concentrations, since trees consume carbon dioxide as they grow. In large part, that success is due to cash payments made to farmers who refrain from cutting down trees. Some of that cash comes from European governments and investors looking for cheap ways to satisfy requirements that they fight climate change. 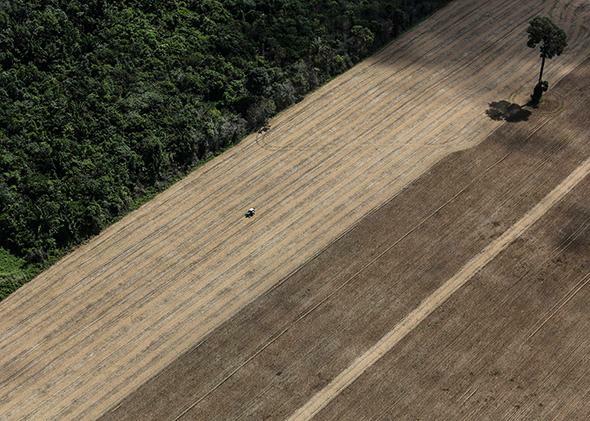 Yet studies in Brazil suggest that slowing deforestation brings economic benefits of its own. By focusing farmers’ attention on land that’s already cleared, rather than on clearing additional land, slowing deforestation tends to increase agricultural output, and thus income, from land already being farmed, according to some researchers. This wheat plantation near Santarém, Brazil, used to be virgin Amazon rainforest. In the industrialized world, economic self-interest has gotten a bad environmental name: It’s the reason, critics say, for the rise in energy consumption that’s contributing to climate change. But in the developing world, where the fight against global warming will be won or lost, economic self-interest may prove the solution.